Insane Peanut Butter Cup Cake! 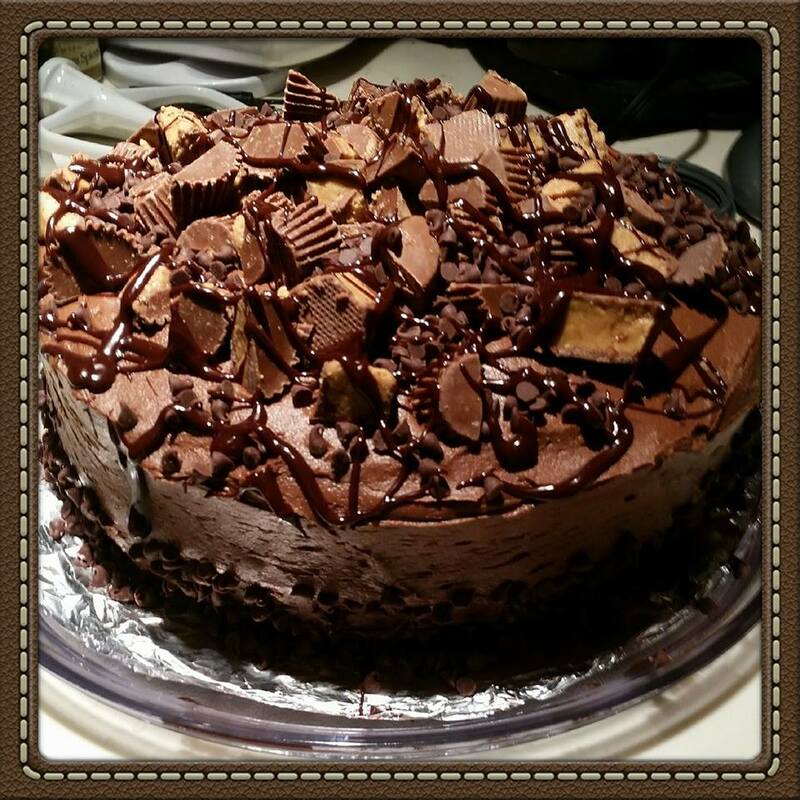 A fudgy chocolate cake with creamy peanut butter filling and a rich chocolate frosting…then I topped with tons of peanut butter cups and melted chocolate! Pure LOVE! If you’re not in it to win it with dessert, this might not be the one for you. If you’re one of those people who use the phrase, “too rich”, or “too sweet” the door is to the left. I’ll see you tomorrow. This one is pretty intense…the rich chocolate cake…the creamy peanut butter filling…the buttery chocolate frosting…can you handle it? It’s man against cake. Not only is this cake over the top delicious, it’s also quite a stunner, if I do say so myself. I feel like I should probably skip all the words right now and just get down to business. I am sure you agree. The cake is an EXTRA simple chocolate cake recipe. I have never had anything but fantastic results. And the frosting is my tried and true chocolate frosting…the same recipe I use ALL the time. It’s in my book too! And then why not top it off with some chopped peanut butter cups and melted chocolate? Not only does this up the “INSANE” factor, but it does wonders for an imperfect frosting job! And then eat it, of course! This is THE perfect special occasion cake! Preheat oven to 350°F. Coat 2, 9-inch cake pans with nonstick spray. Cut 2, 9-inch rounds of parchment paper and place in the bottoms of the pans. Spray again with nonstick spray. Set aside. In the bowl of your stand mixer fitted with the paddle attachment, mix together the sugar, flour, cocoa powder, baking soda, baking powder, and salt on low speed until combined. With the mixer still on low, add in the eggs, milk, vegetable oil, and vanilla. Turn mixer up to medium and mix for 2 minutes, scraping the sides of the bowl as necessary. Turn the mixer back down to low and slowly add in the hot water. Mix for an additional minutes until combined. Divide the batter between the 2 prepared pans. Bake for 30 minutes, or until a toothpick inserted in the center comes out clean. Allow the cake to cool in the pan for 10 minutes and then remove and transfer to a wire rack to cool completely. In the clean bowl of your stand mixer, fitted with the paddle attachment mix the butter and peanut butter together on medium speed until smooth. Turn the mixer to low and slowly add in the powdered sugar. Turn the mixer to medium and mix for 1 minute until combined. Turn mixer back to low and add in 1/4 cup milk. Mix for an additional minute, scraping the sides of the bowl as necessary, until creamy and combined. If desired, add additional milk to achieve desired result. Transfer one of the cooled cakes to a plate or cake stand. Spread the peanut butter filling on top of the cake. Place the other cake on top of the peanut butter filling. In the bowl of your stand mixer fitted with the paddle attachment, combine the butter, cocoa powder, powdered sugar, vanilla, and warm water and mix on low speed, until the mixture just comes together. Slowly increase the speed to medium and beat the frosting for 2 minutes, scraping the sides of the bowl as necessary. Let the frosting cool for 15 minutes before covering the cake. Once you have the cake covered in the chocolate frosting, pile the chopped peanut butter cups on top. Next, sprinkle 2 cup of the milk chocolate chips on top and around the bottom of the cake. Place the remaining 1/4 cup chocolate chips and 1 1/2 milk into a microwave-safe bowl. Heat in 15 second increments, stirring in between each, until the chocolate is smooth. Place the melted chocolate into a small zip-top bag and snip the corner off. Drizzle the melted chocolate all over the cake. There are so many variations of chocolate cake that are so super similar! I have a handful of versions on my site alone! Can’t wait to see your cake, I am sure it will be amazing!! my mouth is watering so bad right now!! or sub in cookie butter, or even Nutella for the peanut butter (and then top it with Ferraro Rocher)!! This should have been in your !! I think you’re right!! haha! My granddaughter is allergic to peanuts and she’d have a fit if I made this knowing she couldn’t eat it. Perhaps cookie butter would be a good sub. I’d certainly eat it! Oh. Em. Gee. I love everything about this cake, Shelly! Oh Shelly…this looks so freaking divine and i cannot wait to make it. Just made this and it is SO good! I followed the recipe exactly but the frosting was too runny and I had to keep adding powdered sugar. Even with just the 8 cups it seemed like way too much frosting (if that’s even possible). Would the logical thing be to use much less water and reduce the powdered sugar? Just curious what others experienced! I have to ask…did you actually use all the frosting? I easily have 1 1/2 cups left and I was generous! Thanks for the recipe. Hope it tastes as great as it looks! Oh… how beautiful! I have never made it myself. This is a great tutorial for one. Perfect! So good! I made this last week, it turned out so moist & yummy. I can’t stop eating it! Thanks for sharing! Tried this recipe today- every bit of this recipe was too runny. I’m an avid baker and followed the written recipe and checked in with the video with every step. The cake mix turned out, the filling was WAY too runny and did not turn out, no matter how much we did to salvage it. The frosting recipe was also too runny, asking for too much water I believe. None of it turned out and I was very disappointed. The recipe written here is very different than what Thisbe video and the picture is showing. Hi Katie, I am sorry you had issues. The cake in the video, and in the pictures, is exactly as the recipe is written. If the peanut butter filling was a little runny for you, you could easily add some more powdered sugar. As for the frosting recipe, you do use warm water so it’s important to let it cool for a few minutes (as per the recipe) before spreading. For either the filling or the frosting, a little more powdered sugar could fix any issues with it being too runny. Thanks! Image if I can. I think key is to use very warm water from the tap. I’m quite impressed with myself, and my small tastes were yummy. Only thing I did was add some expresso powder to the cake mix and chocolate icing. Happy Thanksgiving! So disappointing! Cannot get a good print. An advertisement appears over the filling and garnishment. Did you use the print feature on the recipe itself or did you print the whole post? Have you ever used almond butter in place of peanut butter? I haven’t, only because I am allergic to almonds. I think it would work well. it’s a very good replacement if you don’t have allergy. if you can test it. it’s delicious. I had some of the same issues other people were having with the frosting being too runny. I followed the recipe exactly. I used 2/3 a cup of WARM water. I let cool. It was still too runny. So I added more powdered sugar and let it cool overnight. It is still too runny and now too sugary. Any suggestions on how to fix or avoid next time? Just made the cake and it’s GORGEOUS!! Can’t wait to bring it to a party tonight! Thanks for the great recipe! SO so glad you liked it!! Even though 13-15 cups of sugar appears to be way too much for just one person, I will do my best to finish it. And if you tell me that the recipe is scaled for 12, then you’ll need to give me at least a hundred good reasons why I would want to invite anyone else over. This from an incurable and unrepentant Chocoholic and PB&J addict. Yay this awesome looking cake has been make and is ready to be consumed by the group today. I was really worried during the making since the cake batter is the runniest cake batter I have ever worked with. IOnce baked, it fell in the middle a bit, but that was not an issue since heaps of pb filling and frosting cover all sins. I messed up and bought the mini cups instead of the regular sized, but it wasn’t worth going out late at night to fix that and so my version isn’t quite as elegant as the one above, but every bit as decedent. Hope it tastes as good as it looks! http://eagle.chaosproject.com/images/foodrelated/InsanePBCupCake_05282018.jpg is the image, and other than the mini cups garnish in lieu of regular sized ones, I followed the recipe nearly exactly. I just made this recipe, and it turned out great! One complaint if there was way too much peanut butter filling, and it was very sweet. I think if I make it next time I will go with one cup of powdered sugar instead of three and omit the milk. And I ended using s different frosting recipe which called for 3 cups of powdered sugar instead OF 8!!! And it turned out great! I loved the peanut butter cups and chic chips on top with the drizzled chocolate it looked amazing and so decadent. I will make this recipe again with these adjustments. Thank you for the inspiration! yikes… how were the chocolate and peanut butter parts warm? I don’t think I understand. Yes, this certainly is a sweet cake, it’s really not trying to be anything else. Maybe your aunt was sick. It was great except the filling and frosting made wayyy too much! I’d half the amount if I made it again. The cake base was excellent. Super moist and delicious! Thank you for sharing ? Hi, I am from the UK and we don’t really work in cups here! Do you happen to know the amounts in grams for this recipe please? wow! I like it ,my mouth is watering so bad right now!! Made the peanut butter filling! It’s delicious! Thank you. 1 question: if I didn’t use all, what’s the shelf life? Or should say refrigerator life ?? It’ll keep in the fridge for a week, or you can freeze it for up to a month! I made the cake for my husbands birthday. Everyone raved about it! I’m not sure why some others had problems with the recipe. I also thought the cake batter was thin but the layers baked beautifully in 30 minutes. I made 2/3 of the filling and it was perfect. Also I only made half the recipe of the frosting and it frosted the cake perfectly. It looked like I bought it in a bakery! Thanks for such a great recipe!